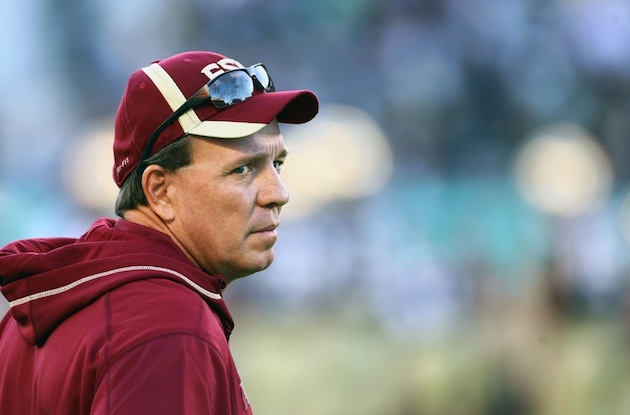 In a bold move, Florida State head football coach Jimbo Fisher announced earlier this week that he is banning his players from using social media site Twitter in order to keep them from embarrassing the program in 140 characters or less. Fisher's move comes after Seminoles cornerback Tyler Hunter took to Twitter to complain about being pulled over by the police earlier this month for incorrectly wearing his seat belt. Hunter tweeted lyrics from rapper Lil Boosie in a rap entitled "[Expletive] The Police." Part of the lyrics quoted included the refrain "kill the cops." Now Hunter's tweet is just the latest black eye for the program - last week, punt returner Greg Reid was arrested in Georgia for possession of marijuana and minor traffic violations. The tweets by Hunter led to Fisher's ban of the social media site. "Twitter is a privilege. When you represent an organization you have to represent it very well or we don't represent it," Fisher told Rivals.com network site Warchant.com. "When we are responsible enough to deal with it, we'll deal with it [return to Twitter]." Last season, Fisher temporarily banned his players from Twitter after a shocking Oct. 8 loss to Wake Forest. The players were bombarded with angry tweets following the loss and Fisher was disappointed with how his players responded on the social media network. With the Seminoles head coach slated to speak on Monday at ACC Media Day, Fisher was away from campus and squeezing in a personal trip, but he still contacted his team to let them know of the new policy. "They have to be very smart, they have to learn," Fisher said. "They just don't understand the ramifications of things. They don't realize how global those things are."